1- Meat is in, no matter what the cholesterol, fat, food trends or anything else is in style, we all love a good piece of meat. 2- Everyone loves a good sauce or salsa. Period. 3- Liquor sells and people like alcohol with their meals. 4- Desserts Rule. Home-made, fresh and sweet is always welcomed. I've never skimped on anything either: butter, sugar, cream..... I always sold out. Heat oven to 350 degrees F. Lightly butter a 9x3" cake pan. Coat with butter, and dust with flour. Set aside. Sift the cake flour, baking powder, and salt in a large bowl. Set aside. Beat 5 yolks and 1/2 cup cold water together with an electric mixer set on medium for 1 min. Gradually add 1 1/2 cups sugar. Add 1 tsp vanilla extract, increase mixer speed to high, and beat until thick and pale -- about 4 min. Beat the egg whites in a large bowl with a mixer set at high speed until soft peaks form -- about 2 min. Sift the flour mixture over egg yolks and fold to combine. Fold in the egg whites; pour batter into the prepared pan, and bake until a toothpick inserted in the center comes out clean -- about 45 min or so (depends on your oven so check). Avoid opening the oven for the first 30 min. Cool completely. For the custard: Whisk the all-purpose flour and 1/2 cup milk together in a small bowl. Warm the remaining milk, 1/2 cup sugar, vanilla bean (or extract) and pod in a small saucepan over med-low heat until sugar is dissolved. Whisk in the flour mixture and cook until thickened -- about 3 min. Whisk egg yolks together in a large bowl. Slowly pour half of the hot-milk mixture into the bowl while whisking continuously (to temper), and return the mixture to the saucepan. Stir continuously with a wooden spoon over med heat until mixture begins to bubble and thickens -- about 3 min. Strain into a bowl and fold in 1 cup of coconut. Cool completely. Wrap and keep chilled until ready to use. Putting it together: Lightly toast the remaining coconut and set aside (on a sheet in the oven, carefully). Bring 1/2 cup sugar, the rum, and 1 cup water to a boil in a small saucepan over high heat, and cook, stirring occasionally, for 5 min. Remove from heat. Split the cake into 3 layers using a serrated knife and brush each layer (to soak) with the rum syrup. Place the bottom layer on a plate and top with half the custard, repeat with the next layer, and place the top layer. 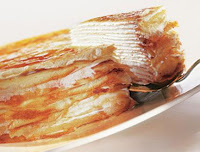 Brush cake with remaining syrup, cover with plastic wrap, and refrigerate at least overnight or up to 24 hours. Whip the cream, vanilla, and remaining sugar to soft peaks. Coat the cake with whipped cream and sprinkle the toasted coconut over the top and gently press onto the sides. Chill for up to 2 hours. Note: Yes I know it sounds rather involved, but it will be well worth it and you will have a most impressive and delectable cake. Drain the pineapples and discard the juice. Melt 6 tablespoons of butter, pour it into a 10-inch round cake pan, and sprinkle with the brown sugars. Arrange the pineapple rings in a single layer over the brown sugars, sprinkle with the nuts and set aside. (you can also use just one kind of brown sugar and no nuts). Combine the flour, baking powder, and salt in a bowl and set aside. Lightly beat the eggs, yolks, and vanilla together in a small bowl and set aside. Beat the remaining 6 tbl of butter and sugar in a large bowl using an electric mixer set on medium-high speed until light and fluffy. Reduce speed to low and alternate in the flour mixture and egg mixture. Pour the batter into the pan and bake until golden brown and a tester inserted in the center comes out clean — about 1 hour and 10 min. Check your oven. Cool in the pan for 10 min on wire rack. Run a small, sharp knife around the edge of the pan to release cake. (you can also warm the bottom of the pan slightly so the cake will release, just be careful with the heat). Preheat oven to 350 degrees F. Take two 9" cake pans and lightly coat the pan with butter, dust with flour, and tap out excess. Sift the flour, baking powder, salt, and baking soda together and set aside. Cream the butter and 1 1/2 cups sugar until light and fluffy in a large bowl using a mixer set at medium-high speed. Add 3/4 cup preserves and the eggs, one at a time, blending each addition thoroughly. Scrape down sides of bowl and beat in vanilla extract and the food coloring. Reduce mixer speed to low and add the flour mixture by thirds, alternating with the buttermilk and ending with a final addition of the dry ingredients. Divide the batter equally between the pans and spread evenly. Bake on the middle rack of oven until a tester inserted in the center of each cake layer comes out clean -- about 20 to 30 min. Cool completely. 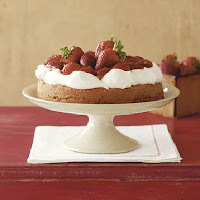 Put it together: Beat the cream and remaining sugar to soft peaks and spread over the top of one layer. (Wrap and freeze the remaining layer for up to 2 months.) Top with strawberries and drizzle with remaining preserves. Serve immediately. In a large bowl, using a mixer set on medium-high speed, beat the cream, sugar, cinnamon, and vanilla until stiff peaks form. Do not overbeat. For Cake: Preheat oven to 350 degrees F. Lightly coat three 9" cake pans (or 2 pans )with softened butter or vegetable-oil cooking spray. Dust with flour and tap out any excess. Set aside. In a medium bowl, combine the flour, baking soda, baking powder, cinnamon, nutmeg, and cloves. In a large bowl, using a mixer set at medium-high speed, beat the butter for 1 min. Add the sugar and continue to beat until blended. Add the eggs and vanilla and beat for 2 more min. Reduce speed to low and add the flour mixture by thirds, alternating it with the applesauce and ending with the dry ingredients. Divide the batter equally among the pans and spread evenly. Bake on the middle rack of the oven until a tester inserted in the center of each cake layer comes out clean -- 35 to 40 min. Cool in the cake pans on a wire rack to room temperature. Using a knife, loosen the cake layers from the sides of the pans and invert the layers onto the wire rack. Putting it together: Place one cake layer on a cake plate. Spread half of the Cinnamon Icing on the layer. Place a second layer over the first and repeat. Top with the final layer and sprinkle with confectioners' sugar, if desired, and serve. Store refrigerated for up to 4 days. Last but by no means least is one of our favorites, and yes, it involves work but the finished product is so delicate, exotic and amazing, I don't even hesitate in making it when the moment is right (just ask my son...) It's the most elegant cake perfect for a holiday and we've enjoyed it on many a New Year's Eve. I hope you will attempt it, it is soooo worth it. The day before, make the crepe batter and the pastry cream. Crepes can always be made ahead, put plastic wrap between each one, lay them in a stack and refrigerate. Crepes can also be frozen and kept on hand to use. Batter: In a small pan, cook the butter until brown like hazelnuts. Set aside. In another small pan, heat the milk until steaming; allow to cool for 10 min. In a mixer on medium-low speed, beat together the eggs, flour, sugar and salt. Slowly add the hot milk and browned butter. Pour into a container with a spout, cover and refrigerate overnight. Pastry cream: Bring the milk with the vanilla bean (and scrapings) to a boil, then set aside for 10 min; remove bean. Fill a large bowl with ice and set aside a small bowl that can hold the finished pastry cream and be placed in this ice bath. In a medium heavy-bottomed pan, whisk together the egg yolks, sugar and cornstarch. Gradually whisk in the hot milk, then place pan over high heat and bring to a boil, whisking vigorously for 1 to 2 min. Press the pastry cream through a fine-meshed sieve into the small bowl. (you only need to do this if you use the vanilla bean, if you use vanilla extract you don't need this) Set the bowl in the ice bath and stir until the temperature reaches 140 degrees on an instant-read thermometer. Stir in the butter. When completely cool, cover and refrigerate. Pass the pastry cream through a sieve once more. Whip the heavy cream with the tbl sugar and the Kirsch. It won’t hold peaks. Fold it into the pastry cream. Lay 1 crepe on a cake plate. Using an icing spatula, completely cover with a thin layer of pastry cream (about 1/4 cup). Cover with a crepe and repeat to make a stack of 20, with the best-looking crepe on top. Chill for at least 2 hours. Set out for 30 min before serving. Note: If you have a blowtorch for creme brulee, sprinkle the top crepe with 2 tbl sugar and caramelize with the torch; otherwise, dust with confectioners’ sugar. Slice like a cake.